Objective: To study infliximab and etanercept in the treatment of refractory juvenile idiopathic arthritis (JIA). Methods: In a non-randomised, prospective, open label study, 24 patients (mean age 10.2 years, range 3.3–16.3) with polyarticular JIA were treated with either infliximab (n=14) or etanercept (n=10). The patients had had active polyarthritis for at least one year and standard treatment had failed. Anti-tumour necrosis factor (TNF) treatment was added to the current drug treatment. Infliximab (3–4 mg/kg) was given intravenously at weeks 0, 2, and 6, and thereafter at 4 to 8 week intervals. Etanercept (0.4 mg/kg) was given subcutaneously twice a week. Improvement of the patients was assessed at 3, 6, and 12 months according to established JIA response criteria. Results: In intention to treat analyses, patients in both treatment groups improved significantly. ACR Paediatric 50 was achieved at 3, 6, and 12 months by 9/10 (90%), 8/9 (89%), and 8/9 (89%) patients with etanercept and by 8/12 (67%), 10/12 (83%), and 7/9 (78%) with infliximab, respectively. At 12 months, ACR Paediatric 75 was achieved by 67% of patients in both treatment groups. Five withdrawals due to adverse effects or lack of efficacy occurred in the infliximab group and one due to lack of compliance in the etanercept group. Conclusion: In this open label clinical study of active JIA, both infliximab and etanercept provided a significant rapid and sustained reduction in disease activity. Adequately powered randomised controlled trials are needed to elucidate the long term safety and efficacy of TNF modulators in the treatment of JIA. In children with JIA, no large scale studies on the efficacy of infliximab have been published. A preliminary study of six months’ infliximab treatment in patients with JIA11 and a case report12 suggested that infliximab might be efficacious in the treatment of JIA. The present prospective non-randomised study in children with refractory JIA was undertaken to compare the efficacy of etanercept and infliximab in a clinical setting over a 12 month period. Twenty four consecutive patients (mean age 10.2 years, range 3.3–16.3) starting treatment with a TNF modulator were enrolled in the study. Every patient had had a severe polyarticular course of JIA13 with active arthritis refractory to our standard treatment for at least one year. The standard treatment consisted of a combination with methotrexate (MTX), prednisolone (PRED), cyclosporin A (CyA), sulfasalazine (SSZ), and/or hydroxychloroquine (HQ) and intra-articular corticosteroid injections. The anti-TNF treatment was added to the current drug treatment: MTX only (n=1), MTX + PRED (n=8), MTX + HQ (n=1), MTX + CyA (n=1), MTX + PRED + CyA (n=6), MTX + HQ + CyA (n=1), MTX + PRED + HQ + CyA (n=3), MTX + PRED + HQ + SSZ (n=1), and MTX + PRED + CyA + SSZ (n=1). In addition, all patients were receiving non-steroidal anti-inflammatory drugs, naproxen or diclofenac. One patient with erosive polyarthritis was receiving homoeopathic treatment only. The choice between the two TNF modulators was made at the discretion of the patients and parents after thorough information given by the paediatric rheumatologist. Fourteen patients started treatment with infliximab and 10 with etanercept. In the infliximab group, three patients were diagnosed with extended oligoarthritis, eight with polyarthritis, two with psoriatic arthritis, and one with systemic onset polyarthritis. In the etanercept group, two patients had extended oligoarthritis, six had polyarthritis, and two had systemic onset polyarthritis. Infliximab (3–4 mg/kg) was given intravenously at weeks 0, 2, 6, and thereafter at four to eight week intervals. Etanercept (0.4 mg/kg) was given subcutaneously twice a week. During anti-TNF treatment, 23 patients continued to receive low dose MTX, but according to clinical judgment and laboratory findings (inflammation markers), other drugs were tapered or in some cases discontinued. This study was approved by the ethical committee of Helsinki University Central Hospital. Written informed consent was obtained from all patients or parents, or both. The JIA response criteria were applied.14 The six response variables (erythrocyte sedimentation rate (ESR), number of active joints, number of swollen joints, parent/patient global assessment of overall wellbeing, doctor’s global assessment of disease activity, and Children’s Health Assessment Questionnaire (CHAQ)15) were determined at 3, 6, and 12 months. In this study, instead of the original 30% improvement,14 the patients were evaluated for 50% and 75% improvement, defined as at least 50% or 75% improvement in at least three of the six variables, with simultaneous 30% or more worsening in only one of the variables allowed (ACR Paediatric 50 or 75, respectively). In an intention to treat analysis, changes in the six response variables from baseline were calculated by Hodges-Lehmann estimates with exact confidence intervals. p Values between groups were calculated by the permutation test with Monte-Carlo estimates. Differences in drug withdrawal between the groups were estimated by the Wilcoxon-Gehan test. Patients in both treatment groups improved significantly (fig 1, table 1). ACR Paediatric 50 at 3, 6, and 12 months was achieved by 9/10 (90%), 8/9 (89%), and 8/9 (89%) patients with etanercept, respectively. In the infliximab group, the criteria for ACR Paediatric 50 were met by 8/12 (67%), 10/12 (83%), and 7/9 (78%) patients. Six of 10 (60%), 7/9 (78%), or 6/9 (67%) patients receiving etanercept and 6/12 (50%), 7/12 (58%), or 6/9 (67%) patients receiving infliximab treatment reached an even more impressive ACR Paediatric 75 at 3, 6, and 12 months, respectively (p values between groups not significant) (fig 1). 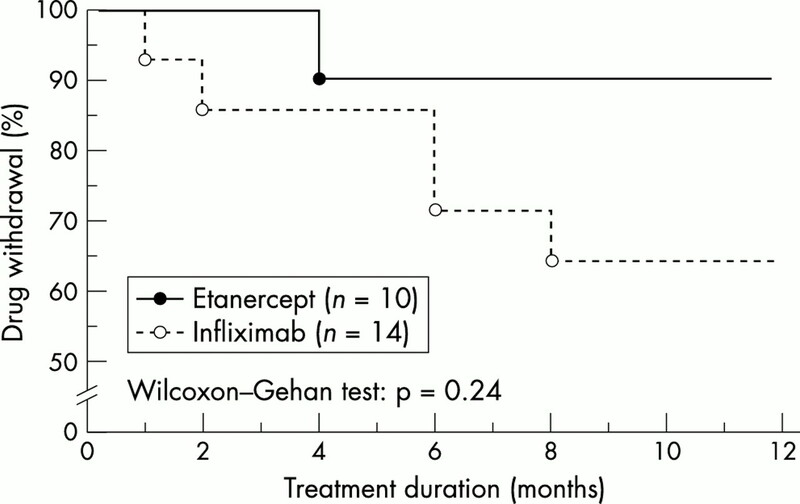 At 3, 6 or 12 months, or at the end point of the treatment, the efficacy of etanercept did not differ statistically from that of infliximab (fig 1, table 1). Comparison of 75% improvement of patients with JIA receiving etanercept or infliximab during the 12 month open clinical study. The number of patients (n) indicates the total number of patients receiving anti-TNF treatment at each time. Nine patients in both groups completed the 12 month study. Of the 10 patients receiving etanercept, one was withdrawn at four months for non-compliance. Of the 14 patients with infliximab, one withdrew at one month, one at two months, two at six months, and one at eight months owing to adverse effects and/or lack of efficacy (fig 2). Side effects in three patients with polyarthritis were reactions related to infusion, chest pain, dyspnoea, and urticaria, which could not be adequately controlled by slowing the rate of infusion or by premedication. A 15 year old boy with a nine year history of systemic onset polyarthritis (no systemic features at the time of the study) developed symptoms and signs resembling a macrophage activation syndrome less than 24 hours after the second infliximab infusion. He had high fever, chills, rash, general malaise, and raised ESR, C reactive protein, and liver transaminases, and pancytopenia. Blood cultures and extended viral serology were negative. Treatment was started with broad spectrum antibiotics and he received three pulses of high dose (30 mg/kg) intravenous methylprednisolone. Because of his rapid recovery, a bone marrow examination was not done. A 9 year old girl of Asian origin and with a history of previous alopecia whose father had autoimmune alopecia, became anti-dsDNA positive and developed alopecia at six months on infliximab. The patient continued to receive low dose MTX and had no signs of arthritis at 12 months. One patient with a 10 year history of polyarthritis did not reach ACR Paediatric 50 (or 30) and infliximab treatment was discontinued at six months. 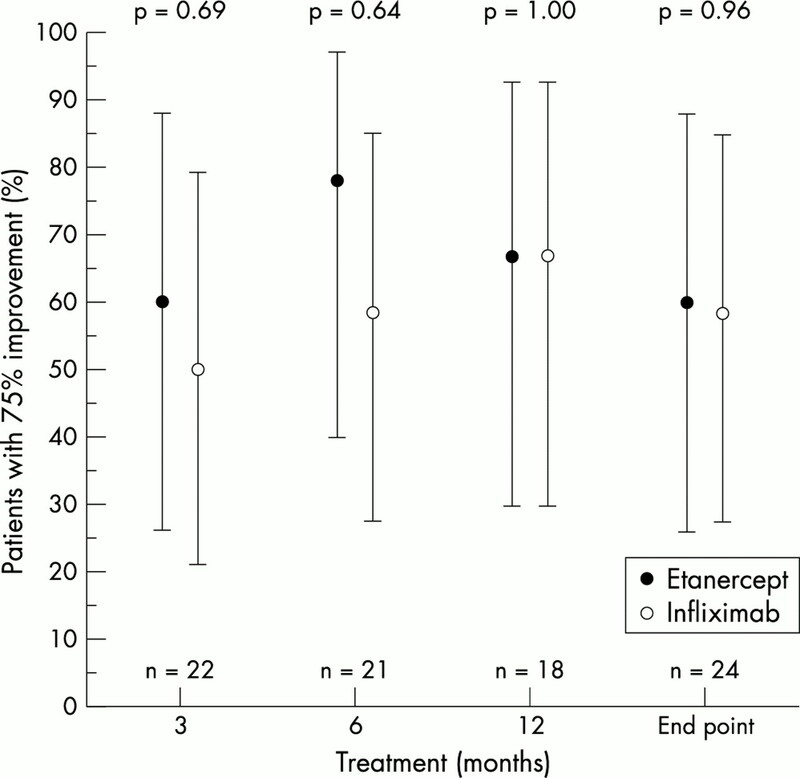 Drug withdrawal in patients with JIA (%) receiving etanercept or infliximab during the 12 month open clinical study. Three patients in whom infliximab treatment was discontinued because of side effects were switched to etanercept. All three fulfilled ACR Paediatric 50 and 75 at the end point. With etanercept treatment the remarkable clinical response was sustained. The one patient who discontinued etanercept owing to non-compliance reached ACR Paediatric 50 at the end point. She was switched to infliximab, with a sustained response. At 12 months, 23 patients continued to receive low dose MTX. Of the 19 patients receiving oral steroids, prednisolone was tapered in seven, discontinued in eight, and held on a low alternate day dose in four. Of the disease modifying antirheumatic drugs (DMARDs) given at baseline, CyA was discontinued in 11/12 patients, SSZ in 1/2 patients, and HQ in 6/6 patients. To keep the patients ambulatory, occasional intra-articular steroid injections were given. In both treatment groups, the number of joints injected during the 12 months of anti-TNF treatment diminished significantly as compared with the 12 month period before the study (data not shown). As far as we know, this is the first report on the efficacy of infliximab in the treatment of children with refractory JIA. We compared etanercept and infliximab prospectively in a clinical setting. In most cases the clinical response to both infliximab and etanercept was either good or excellent, making it possible to taper or discontinue other DMARDs. The efficacy of both TNF modulators was observed in most of the objective and subjective JIA response variables.14 We used ACR Paediatric 50 and 75 criteria, which both indicate substantial clinical improvement. A previous study on the efficacy of etanercept in the treatment of JIA focused on 30% improvement, but data on 50% improvement at seven months were also available: the criteria for ACR Paediatric 50 were met by 72% of the patients.4 The slightly better response seen in this study, 89% of patients with etanercept and 83% with infliximab at six months, may be ascribed to two reasons: (a) this was an open label trial, and (b) we used concomitant DMARDs. In a case report on the short term treatment of systemic JIA with infliximab, Elliott et al reported that systemic features of the disease improved but the arthritis did not.12 In our study, infliximab treatment significantly improved the articular symptoms and signs. The patient reported by Elliott et al received only two infusions of infliximab with a one week interval,12 whereas we used several infusions at longer intervals. However, the observed effects in systemic onset JIA relate to only a very few patients and hence firm conclusions cannot be drawn. None of our patients with systemic onset JIA had systemic features at the time of the study. Side effects were more common and also more serious with infliximab than with etanercept. The incidence of adverse effects with infliximab was also high as compared with that reported in adult patients.2,7 Whether this was due to the concomitant use of other DMARDs, or was just an incidental finding in the small number of patients studied in our series, remains to be seen. None of our patients had a severe infection during the study period. Reported infectious and autoimmune complications and other side effects of anti-TNF treatment have raised concerns about the safety of TNF blockade. However, the present and previous results on the efficacy of TNF blockade show that these drugs offer a significant clinical advance in the treatment of JIA. Randomised head to head comparisons of the two TNF modulators are indicated to elucidate the long term safety and efficacy of new anti-TNF treatments of JIA. We are grateful for the statistical assistance provided by Hannu Kautiainen, BSc. Moreland LW, Baumgartner SW, Schiff MH, Tindall EA, Fleischmann RM, Weaver AL, et al. Treatment of rheumatoid arthritis with recombinant human tumour necrosis factor receptor (p75)-Fc fusion protein. N Engl J Med1997;337:141–7. Maini R, St Clair EW, Breedveld F, Furst D, Kalden J, Weisman M, et al. Infliximab (chimeric anti-tumour necrosis factor alpha monoclonal antibody) versus placebo in rheumatoid arthritis patients receiving concomitant methotrexate: a randomised phase III trial. Lancet1999;354:1932–9. Moreland LW, Cohen SB, Baumgartner SW, Tindall EA, Bulpitt K, Martin R, et al. Long-term safety and efficacy of etanercept in patients with rheumatoid arthritis. J Rheumatol2001;28:1238–44. Lovell DJ, Giannini EH, Reiff A, Cawkwell GD, Silverman ED, Nocton JJ, et al. Etanercept in children with polyarticular juvenile rheumatoid arthritis. N Engl J Med2000;342:763–9. Kietz DA, Pepmueller PH, Moore TL. Clinical response to etanercept in polyarticular course juvenile rheumatoid arthritis. J Rheumatol2001;28:360–2. Kietz DA, Pepmueller PH, Moore TL. Therapeutic use of etanercept in polyarticular course juvenile idiopathic arthritis over a two year period. Ann Rheum Dis2002;61:171–3. Lipsky PE, van der Heijde DM, St Clair EW, Furst DE, Breedveld FC, Kalden JR, et al. Infliximab and methotrexate in the treatment of rheumatoid arthritis. N Engl J Med2000;343:1594–602. Targan SR, Hanauer SB, van Deventer SJ, Mayer L, Present DH, Braakman T, et al. A short-term study of chimeric monoclonal antibody cA2 to tumour necrosis factor alpha for Crohn’s disease. Crohn’s Disease cA2 Study Group. N Engl J Med1997;337:1029–35. Rutgeerts P, D’Haens G, Targan S, Vasiliauskas E, Hanauer SB, Present DH, et al. Efficacy and safety of retreatment with anti-tumour necrosis factor antibody (infliximab) to maintain remission in Crohn’s disease. Gastroenterology1999;117:761–9. Chaudhari U, Romano P, Mulcahy LD, Dooley LT, Baker DG, Gottlieb AB. Efficacy and safety of infliximab monotherapy for plaque-type psoriasis: a randomised trial. Lancet2001;357:1842–7. Lahdenne P, Honkanen V. Infliximab vs etanercept in the treatment of severe juvenile chronic arthritis [abstract]. Arthritis Rheum2000;43(suppl):S1888. Elliott MJ, Woo P, Charles P, Long-Fox A, Woody JN, Maini RN. Suppression of fever and the acute-phase response in a patient with juvenile chronic arthritis treated with monoclonal antibody to tumour necrosis factor-α (cA2). Br J Rheumatol1997;36:589–93. Petty RE, Southwood TR, Baum J, Bhettay E, Glass DN, Manners P, et al. Revision of the proposed classification criteria for juvenile idiopathic arthritis: Durban, 1997. J Rheumatol1998;25:1991–4. Pelkonen P, Ruperto N, Honkanen V, Hannula S, Savolainen A. Lahdenne P. The Finnish version of the Childhood Health Assessment Questionnaire (CHAQ) and the Child Health Questionnaire (CHQ). Clin Exp Rheumatol2001;19:S55–9.